WORLD LEADERS PREDICT A Divorce Between America and Europe! Is the day of miracles PAST? We read in the New Testament that when Jesus Christ was on earth 1900 years ago, He HEALED THE SICK. And it seems there are so MANY MORE sick today than there were then. Well, is the day of miracles past? WHAT ABOUT this thing we call divine healing? I've encountered scores of folks who say, "Well, I know God can HEAL today IF it's His will but HOW CAN WE KNOW WHETHER IT'S HIS WILL? Some think Jesus Christ is like the professor emeritus at the university — He USED to do great things, but now He's grown old and feeble and doesn't perform many miracles anymore. But, we read in I Cor. 15:3-4: "For I delivered unto you first of all that which I also received, how that Christ died for our sins according to the scriptures; And that He was buried and that He rose again the third day according to the scriptures." And again in Heb. 13:8 — "Jesus Christ the same yesterday, and today, and forever," and in John 14:12 — "Verily, verily, I say unto you, He that believeth on me, the works that I do shall he do also; and greater works than these shall he do; because I go unto my Father." My friends, do you know when divine healing — healing direct by a miracle from ALMIGHTY GOD, as a result of believing PRAYER began? And incidentally, let me say I'm not referring to some modern MENTAL science, so-called, or power of mind over matter, or hypnotism. I'm speaking only of physical healing performed directly by the Eternal Creator GOD as a result of BELIEVING PRAYER. Do you know when this first began? Well, most of you are going to be surprised. It didn't begin with the ministry of Jesus of Nazareth at all. It began MANY CENTURIES BEFORE THAT! It began WHEN the CHURCH began! Most people think the CHURCH was first started after the resurrection of Christ — on the Day of Pentecost. That was merely the NEW Testament Church. But the Church started long before that — it started way back in the days of MOSES! Of course, that was the OLD Testament Church, but it was God's CHURCH just the same. Listen! Acts 7:38 — "This is He, that was in the church in the wilderness with the angel which spake to Him in the mount Sina, and with our fathers: who received the lively oracles to give unto us." Let me quote to you the first account in all history of direct divine healing. Ex. 15:23-26 — "And when they (the children of Israel) came to Marah, they could not drink of the waters of Marah, for they were bitter: therefore the name of it was called Marah. And the people murmured against Moses, saying, What shall we drink? And he cried unto the Eternal and the Eternal showed him a tree, which when he had cast into the waters, the waters were made sweet: there he made for them a statute and an ordinance, and there he proved them, And said, If thou wilt diligently hearken unto the voice of the Eternal thy God, and wilt do that which is right in His sight, and wilt give ear to His commandments, and keep all His statutes, I will put none of these diseases upon thee, which I have brought upon the Egyptians: for I am the Eternal that health thee." And do you know that the same conditions, "If you will obey and keep my commandments," etc. — apply today, and that's one reason why a lot of people who have a little light on divine healing and believe in it are not being healed! Let me quote that to you over in the NEW Testament, my friends, I John 3:22 — "And whatsoever we ask, we receive of Him," WHY? "because we keep His commandments, and do those things which are pleasing in His sight." Well, with so many telling the people, and so many people believing, that Jesus Christ did away with the commandments, it's no wonder that many of us are not having prayers answered today! "Whatsoever we ask, we receive of Him, because we keep His commandments, and do those things that are pleasing in His sight." Yes, God is the same yesterday, today and forever. He is not changed and the same conditions apply today that did back in the days of Moses. Obedience and faith. And Jesus said, "According to your faith be it unto you." You will notice that God said, "I am the Lord (or the Eternal) that heals you." He is a jealous God in a sense, so far as the prerogatives of God are concerned. And so, turn over to the 20th chapter of Exodus where God was giving the Ten Commandments to all the people. Moses didn't give the people the Ten Commandments. GOD gave the people the Ten Commandments, and He said, "I am the Eternal thy God ... Thou shalt have no other gods before me." He had said, "I am the God that heals you," and now He says that you should "have no other gods before me." You know, my friends, a doctor can't heal! And any honest doctor will admit it. And none of his drugs, or medicines, or knives can heal. There is no healing in any of them. There is only one kind of healing, and that is healing directly by the almighty God. There is no other healing ! Nothing else is healing in the strictest sense. God says, "I am the Eternal that heals you," and He isn't going to let anyone else heal you. He says, "Thou shalt have no other gods before me," — no other healers, in other words. One of the NAMES of God is "Jahveh-rapha" (as used in Ex. 15:26) meaning "God Healer." Now turn over to the 23rd chapter of Exodus, and the 24th and 25th verses. God says, "Thou shalt not bow down to their gods," (these Gentile gods) "nor serve them, nor do after their works ... ye shall serve the Eternal your God, and He shall bless thy bread, and thy water; and I will take sickness away from the midst of thee." That's what God said to Israel back in the days of Moses, long, long before the days of Christ. Now at first God alone was their King, too, but soon they began to notice how the heathen nations around them were doing, and they wanted a human man for their king, so God permitted it. He gave them Saul, later David and his dynasty, and of course later they did begin to turn to the heathen methods of doctoring and medicine. Notice King Asa of Judah as an example. He turned to the king of Syria and paid him money to become an ally. You know God had said that He would fight their battles for them. They didn't need foreign allies. They should have depended upon God and whenever any of the Kings of Israel or Judah did it they won every time. But this King Asa of Judah forsook God. He relied instead upon the King of Assyria. He sent him money and treasure to bribe him to become his ally. I don't think they called it lend-lease in those days, but he depended upon a Gentile ally, instead of trusting in God to fight his battles. Later Asa was diseased. Notice, II Chron. 16:12 — "And Asa in the thirty and ninth year of his reign was diseased in his feet, until his disease was exceeding great: yet in his disease he sought not to the Lord, but to the physicians. And Asa slept with his fathers, and died in the one and fortieth year of his reign." Now there, my friends, is where medical "Science" (falsely so called) came from. From the heathens. And I want you to notice what God's Word says about it. This is pretty plain talk. I hope I'm not offending people, but I have to preach God's Truth. You know God says to "Cry aloud and spare not, and tell my people their sins," and proclaim the Word of God faithfully and truthfully, and, well, that's just what I have to do. I want you to notice another experience recorded in II Kings, first chapter: "Ahaziah fell down through a lattice in his upper chamber that was in Samaria, and was sick." Ahaziah was the King of Israel. So he sent messengers and he said unto them, "Go, inquire of Baal-zebub the god of Ekron whether I shall recover of this disease." Baal-zebub the god of Ekron was the patron deity of medicine — the medicine god of Ekron. The way they went to inquire of him was to go to the medical doctors of Ekron, who were supposed to have direct contact with, and the blessing of, the god of medicine. "But the angel of the Eternal said to Elijah the Tishbite, Arise, go up to meet the messengers of the king of Samaria, and say unto them, Is it not because there is not a God in Israel, that you go to inquire of Baal-zebub the god of Ekron?" "Now therefore thus saith the Lord, Thou shalt not come down from that bed on which thou art gone up, but shalt surely die. And Elijah departed." Now if you will turn to the end of the chapter to the 17th verse it says, "So he died according to the word of the Eternal which Elijah had spoken." Now people today misunderstand this truth entirely. So many seem to believe we should go to the doctors, then pray for God to cause their medicines to heal. They assume God raised up medical science and blesses it and works thru it. But this is merely the same old Pagan practice of idolatry tho very few realize it today. Truly all nations have been DECEIVED into practicing Pagan idolatry believing it is true Christianity! For the real Christian who has faith in God there is a better way! Now, there is one other example before I leave this that I would like to give you, and that's the example of Hezekiah. That's in II Kings the 20th chapter and the first seven verses. Will you notice this: "In those days was Hezekiah sick unto death. And the prophet Isaiah the son of Amoz came to him, and said unto him, Thus saith the Lord, Set thine house in order; for thou shalt die, and not live. Then he turned his face to the wall, and prayed unto the Eternal, saying, I beseech thee, O Eternal, remember now how I have walked before Thee in truth and with a perfect heart, and have done that which is good in Thy sight. And Hezekiah wept sore." He put his heart in this prayer! He was in earnest about this. Notice too that he obeyed God and he trusted Him. He didn't trust anything or anybody else; he trusted God alone. And he was in earnest. "And it came to pass, afore Isaiah was gone out into the middle court, that the word of the Eternal came to him, saying, Turn again, and tell Hezekiah the captain of my people, Thus saith the Eternal, the God of David thy father, I have heard thy prayer, I have seen thy tears: behold, I will heal thee: on the third day thou shalt go up unto the house of the Lord. And I will add unto thy days fifteen years; and I will deliver thee and this city out of the hand of the king of Assyria; and I will defend this city for mine own sake, and for my servant David's sake." And so he was healed. Now, that reminds me of a time when I was called to the sickbed of a woman, who had called for me to come and pray with her. When I arrived she said, "Well, I know that God could heal me if it's His will, but I'm not sure it's His will." I said to this woman, "Well, you know it's too bad you can't have your sins forgiven, because, you know, God could forgive your sins too, thru the blood of Christ, IF IT WAS HIS WILL. But of course since we can't know anything about His will, why, how are you ever going to be saved?" "Well," I said, "You can have faith in that?" "Yes," she said, "I certainly can." "Well, you know," I said, "I believe you're depending on this: Psalm 103:2-3 — 'Bless the Eternal, O my soul, and forget not all his benefits: Who forgiveth all thine iniquities'!" I said, "There it is, He forgives every one of your iniquities. Is that right?" She exclaimed, "Why, yes!" Then I said, "Listen, why didn't you read the rest of that sentence? — 'Who forgiveth all thine iniquities; who health all thy diseases.' "
But there are physical laws, too, that regulate your physical health. And if you break those laws, or if they are broken, it is transgression of law, and it exacts a PENALTY. It might be an accident, or something you didn't do yourself at all — you might not have been guilty of any wrong and yet nature's laws have been violated, or you wouldn't be sick. It isn't natural to be sick. It's unnatural, and wrong. So sickness is only the penalty of physical transgression, and whenever one is sick, he is paying that penalty! The penalty of transgressing these physical laws that regulate the human body is PAIN, suffering, sometimes the first or physical DEATH. It's a physical transgression, or sin — and there's a physical PENALTY for that sin. Consequently, healing is nothing more or less than the FORGIVENESS OF SIN — the consequent removal from us of the PENALTY we have incurred — and no human doctor, no medicine, no drug, has ever been given power to forgive sin — whether spiritual or physical! NONE BUT GOD CAN FORGIVE SIN ! Once Jesus was preaching inside a house. As soon as word spread that He was in the house, so many people flocked to the place no more could crowd in, and a large crowd was pushing around the door. Then came four men carrying a bed, upon which was lying a man very ill with the palsy. Finding themselves unable to get this man thru the crowd at the door, they went upon the roof, tore away the tiling, and let the bed down thru a hole in the roof in front of Jesus. He did not give the man drugs or medicines, He FORGAVE THE PHYSICAL SINS which had caused the palsy ! The scribes and Pharisees began to reason, saying, "Who is this which speaketh blasphemies?" (Yes, and the modern doctors think believing Christians are equally blasphemous today when we trust the SAME Jesus for healing.) "Who can forgive sins," reasoned the Pharisees, "but GOD ALONE?" Yes, who? Certainly doctors can't. Drugs can't. Surgery can't. None but GOD ALONE can forgive sin. And healing is forgiveness of sin ! "But when Jesus perceived their thoughts, He answering said unto them, What reason ye in your hearts? Whether is easier, to say, Thy sins be forgiven thee, or to say, Rise up and walk? But that ye may know that the Son of man hath power upon earth to forgive sins, (he said unto the sick of the palsy), I say unto thee, Arise, and take up thy couch, and go into thine house. And immediately he rose up before them, and took up that whereon he lay, and departed to his own house, glorifying God." Now notice, please! The Pharisees knew NONE could forgive sins, but GOD ALONE! And, in order to prove to them that healing is the forgiveness of sins — and that He, Jesus, was actually USING the very POWER OF GOD in healing, Jesus HEALED this man in front of their eyes! He said, "Arise, and take up thy bed, and WALK"! (Mark 2:9.) WHY? "That ye may KNOW that the Son of man (Christ) hath power on earth to forgive sins"! THAT'S WHY! Turn to it. Read it in your own Bible! Healing is FORGIVENESS OF SINS! Therefore, since GOD ALONE can forgive sins, GOD ALONE CAN HEAL THE SICK ! Now God "forgiveth ALL thine iniquities," and "health ALL thy diseases." Well, how does God forgive our spiritual sins? Sin is the transgression of LAW. (I John 3:4.) That's the Bible definition of SIN. God's law of "LOVE" is a spiritual law (Rom. 7:14). The penalty is DEATH (Rom. 6:23). How does God forgive our spiritual transgressions — remove the DEATH penalty from us? Why, by having given His only begotten Son, who, while we were yet sinners, DIED FOR us. (John 3:16; Rom. 5:8.) In other words, CHRIST PAID THE PENALTY IN OUR STEAD! So since He paid the penalty we have incurred, for us, in our stead, God legally can remove the penalty from us. We do not have to pay the penalty, because JESUS paid it for us! Then HOW does God forgive physical sins? Why, exactly the same way! Jesus paid the penalty for them, too, in our stead! Is that in the Scripture? Most certainly it is! There it is! Turn to it in your own Bible, and read it! Jesus healed ALL that were sick, because He Himself took our physical infirmities, and bare our sicknesses! Let Peter answer: "By His STRIPES ye are healed" — I Peter 2:24! Just before Jesus was taken out to be crucified, He submitted voluntarily to being BEATEN WITH STRIPES. "Then released he Barabbas unto them: and when he had scourged Jesus, he delivered Him to be crucified." (Mat. 27:26.) "Then Pilate ... took Jesus, and scourged Him." (John 19:1.) Jesus suffered this PHYSICAL PAIN, actually breaking open His body in great welts, in order to pay for you, in your stead, the pain, suffering, sickness, or other penalty of your physical transgressions! Notice the instruction of Paul, in I Cor. 11:23-30. "The Lord Jesus the same night in which He was betrayed took bread: and when He had given thanks, He brake it, and said, Take, eat: this is my body, which is broken for you: this do in remembrance of me." His body was BROKEN — beaten with lashes — and by HIS STRIPES we are HEALED! Thru this, He, Himself, TOOK our infirmities and bare our sickness! Now complete Paul's instruction in this passage. Let him make this meaning absolutely plain and clear! "Whosoever shall eat this bread ... unworthily, shall be guilty of the body and blood of the Lord ... For he that eateth and drinketh unworthily, eateth and drinketh damnation to himself, not discerning the Lord's body." That is, not UNDERSTANDING that Jesus body was broken FOR OUR HEALING! Now continue: "For this cause many are weak and sickly among you, and many sleep" — that is, are DEAD! (Verses 29-30.) Because they do not understand Jesus' body was broken for our HEALING — because they take this bread unworthily (that is, not trusting in Jesus' stripes for healing), many are suffering sickness, many have died — the penalty of physical transgression! We take the broken bread UNWORTHILY if, and when, we take it at communion service and then PUT OUR TRUST IN DOCTORS AND MEDICINES, instead of in Christ — thus putting ANOTHER god before HIM! So, many are sick. Many die! Do you see? Do you UNDERSTAND? God said, "I am the God that heals you — you shall have no other gods before me!" His name is "Jahveh-Rapha" — God our HEALER! If God is the Healer — the only real Healer-and if medical science came out of the ancient heathen practice of medicine-men supposed to be in the good graces of imaginary gods of medicine, is there, then, no need for doctors? Yes, I'm quite sure there is. But if all people UNDERSTOOD and practiced God's TRUTH, the function of the doctor would be a lot different than it is today. Actually, there isn't a cure in a car-load — or a train-load — of medicine ! Most sickness and disease today is the result of faulty diet and wrong eating. The true function of the doctor should not be to usurp GOD'S prerogative as a HEALER, but to help you to observe nature's laws by prescribing correct diet, teaching you how better to live according to nature's laws. In other words, to PREVENT sickness, not heal after you are sick! Unfortunately, most doctors today are woefully unprepared properly to advise patients about diet. They studied MEDICINE — not FOODS! There are a few schools of "healing" coming along today somewhat along this line, who work more with nature's laws, and not with drugs and medicines — the naturopaths, osteopaths and chiropractors, etc. These may and may not be good, largely according to the school from which they came and the ability of the man himself. If something breaks on my automobile — something that can be fixed back either by myself or a specialist in a garage, I do not just PRAY and DO NOTHING, and expect God to do for me what I can do for myself. If you break an arm, or other bone, it certainly is right to take it to a specialist and have him SET IT. He can't HEAL it, however — you should TRUST GOD to do that. So, you see, there are a number of functions which human doctors or physicians can rightly perform. But remember that healing is, after all, OUT OF THEIR LINE — only GOD can heal! Only God can forgive sin! Notice, none of these physicians were able to heal. Rather, this woman grew constantly worse. She actually SUFFERED many things of these many physicians! And yet they CHARGED HER A PRICE — they took all she had — all her living! In how many homes is that experience being repeated TODAY? Listen! Only GOD can heal — and it is something He GIVES you — without money and without price — NO CHARGE WHATSOEVER! It's as FREE as salvation! WHY, then, do people place their faith and their trust in human men who have no power to help them — sometimes spend all their money on these men of a "science, falsely so called" — and be utterly unable to place any FAITH in GOD to heal them? God can, and WILL heal you if you're sick! He PROMISES to do it! He's ABLE! He WILL — He says so! It costs you nothing! 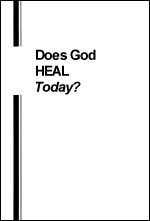 Now let's settle this question — "Is it God's WILL to heal me?" once and for all. "Be ye not unwise, but UNDERSTANDING what the will of the Lord is." (Eph. 5:17.) How do YOU KNOW God's will? Is it His will to forgive your sins — to give you eternal life? Well, HOW DO YOU KNOW? The BIBLE is the revelation of God's will. It is His very Word! Now if He tells you in plain language it is His will to SAVE you, you believe Him! And when He tells you in the same kind of plain language it is His will to HEAL you, YOU MUST BELIEVE HIM! Otherwise you make God out a liar. If you can't believe God when He says HE is the One who HEALS YOU — when He says He is the One who HEALETH ALL THY DISEASES — yes, ALL of them — then how can you believe Him when He says He "Forgiveth all thine iniquities" ? If one of those promises — WRITTEN PROMISES — of Scripture can be broken, so can the other. He commissioned His twelve disciples to HEAL, as well as preach. "Then He called His twelve disciples together, and gave them power and authority over all devils, and to cure diseases. And He sent them to preach the kingdom of God, and to heal the sick" (Luke 9:1-2). GOD ALONE has power to HEAL. But Christ Jesus delegated this power to His MINISTERS whom He was sending out to preach! Show me where the Eternal GOD, who alone has the power to heal, ever delegated that power to the doctors, physicians, of medical science! HE NEVER DID! They do not HAVE the power to heal, but every true minister of Jesus Christ — if he is one whom God has called to the ministry — DOES HAVE THAT POWER! Well, what a shame that most ministers today do not KNOW that they have been given that power, and most people who are sick do not know it either! Later Jesus sent 70 other disciples on a special mission. And He commanded them to "HEAL THE SICK" wherever they went (Luke 10:1, 9). His final parting COMMISSION for all ministers of the Gospel, after His resurrection, just before ascending to heaven, was this: "Go ye into all the world, and preach the gospel to every creature 16:15-18). Now that's a PROMISE! Jesus said they SHALL recover! Almost immediately after the day of Pentecost when the Holy Spirit came, Peter and John, in the name of Jesus Christ, healed the cripple, lame from birth (Acts 3:1-11). As a result, they were thrown into prison, but after they were released they met with the other disciples and prayed earnestly to God, saying: "And now, Lord, behold their threatenings: and grant unto thy servants, that with all boldness they may speak thy word, by stretching forth thine hand to HEAL." "And when they had prayed, the place was shaken where they were assembled together; and they were all filled with the Holy Ghost, and they spake the Word of God with boldness" (Acts 4:29-31). Afterward so many were healed, that even Peter's shadow passing over the sick resulted in their healing, THRU GOD'S POWER (Acts 5:15). Those who came to these ministers of Christ, for healing by PRAYER to GOD, were HEALED, every one" (Acts 5:16). Now God is the SAME, today — and hundreds today, are being healed by that very method, given to us in the Word of God! In my office we hold a daily prayer service. All letters requesting special prayer are brought in, and members of my staff join me in interceding with God for each one. All who ask prayer for HEALING are given special consideration and prayer. And, since it is impossible for me to visit each of these in their own homes, I anoint a handkerchief in each case, following the Apostle Paul's example, and this is mailed to the one who is sick. "Is any sick among you? let him call for the elders of the church; and let them PRAY over him, anointing him with oil in the name of the Lord: and the prayer of FAITH shall save the sick, and the Lord shall raise him up; and if he have committed sins, they shall be forgiven him" (Jas. 5:14-15). Instead, God says call GOD'S MINISTERS. And let them PRAY, anointing with oil (the type and symbol of the Holy Spirit). Then GOD PROMISES He will HEAL YOU! I can't heal you. No minister can heal you — that is, directly. But God PROMISES that when you call for His called ministers, and they PRAY the prayer of faith (not doubt), and anoint with oil, that GOD will HEAL! And He has given His ministers authority to use the POWER contained in the NAME of Jesus Christ, and in and thru that name, to heal — tho remember it is always GOD who actually does the healing, not the minister. Now if the president of some large company sends you a check for $100, you take that check to the bank and you have PERFECT CONFIDENCE you'll get the $100. That check is simply his written PROMISE to pay you the $100. He is a man, and you TRUST HIM. You don't shake at the knees, or try to work up FAITH enough to get that check cashed. Of course not. That would seem silly. Well, the Bible is the written WORD OF GOD. I have shown you God's written promise to PAY you a certain thing, upon demand — HEALING! Then how much more silly is it when you try to work up faith, and strive to have faith to just TRUST GOD to do what He promised ? Is His Word good? Do you BELIEVE it? Do you? If you do, then cash His "checks" on the "Bank of Heaven," and EXPECT to receive what God promises! Just like you EXPECT to receive the money from the check at the bank. That is real faith! One word of caution! You can't dictate to God. He usually doesn't do things OUR way or always in OUR time. Leave that to Him! He PROMISES to heal you. Accept His promise. STAND ON THE PROMISES! Expect the answer! You KNOW you'll get it. But leave the "how" and the "when" to God. Let Him do it His way and in His time. Faith is the evidence of things NOT SEEN — not felt. Don't pay any attention to how you feel, or what you see, after you have called upon God for healing. Just KNOW YOU are to have it — and that's that! In our many, many experiences, we have had healings in our own family and many other cases that were instantaneous. Then I'm thinking now of a woman who came to me and another minister for prayer for healing. After we anointed her we noticed no change and she felt none. It was four days later that she was suddenly, instantly healed. I've known some to heal gradually. It was even so in Jesus' own ministry — one began to mend from that hour! Leave the "how" and "when" to God, but KNOW His promise is SURE!